In every market bubble, there’s a telltale sign of a top. On Wall Street in 1929, it was shoeshine people giving stock tips to shrewd manipulators like Joe Kennedy. At the height of the dot-com bubble in early 2000, it was startup companies with no profits buying multimillion-dollar TV ads on the Super Bowl broadcast. Remember the Pets.com sock puppet? Now comes the latest sign of a bubble top in bitcoin and other cryptocurrencies. Venezuela is a major oil exporter and potentially rich country that is on the verge of complete collapse due to corruption, theft and incompetence. Venezuela’s currency is worthless, it has begun to default on its bonds and there are riots in the streets. Supermarket shelves are bare and political dissent is being squashed, sometimes with violence. What plan does the government of Nicolás Maduro have to save the day? Launch a cryptocurrency! 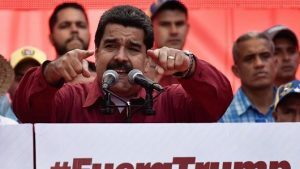 As this article reports, Maduro has announced that Venezuela will launch a new cryptocurrency called the “petro,” backed by Venezuela’s oil reserves. The use of blockchain technology makes sense for Venezuela as a way to avoid U.S. sanctions through U.S. control of the dollar payments system. But the rest of the plan is ridiculous. Legitimate oil buyers will not participate in a scheme that’s illegal under U.S. law because they could become subject to sanctions and penalties themselves. Once Venezuela defaults on its external debts, its oil will be seized on the high seas by creditors, which will remove the collateral behind the new cryptocurrency. The problems are too numerous to explain in detail here. But as the sign of a bitcoin market top, the launch of the “petro” tells you all you need to know.